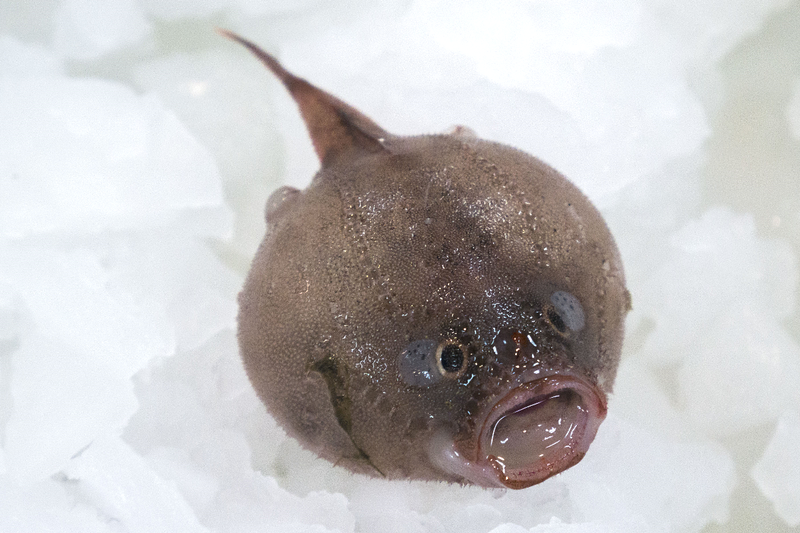 What’s not to like about the cute little coffinfish we collected a few days ago? 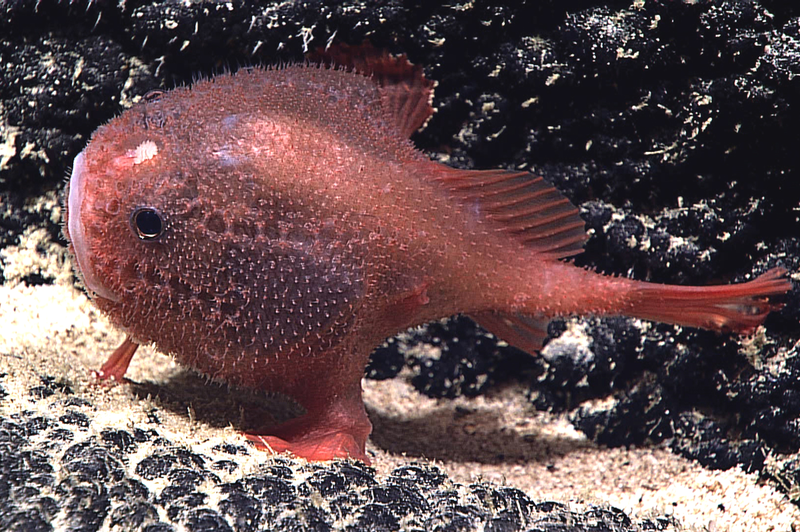 It belongs to a curious group of deep-sea anglerfishes – the Chaunacidae – which live on muddy or rocky seafloors around the world. Most species of coffinfish inhabit the continental slope in depths to 2000 metres, although some occur in much shallower waters. The largest grows to about 30 cm in length, but most only reach 20 cm or so. They have some pretty neat common names too, like Furry Coffinfish and Pencil Coffinfish. And there’s also the Redshoes Coffinfish – called the Redshoes Frogmouth by our Kiwi friends. You can see how that species acquired its name. Coffinfishes are usually pinkish, reddish or orange, sometimes with greenish, yellow or brownish markings. Their round flabby bodies taper to a small tail, and are densely covered in tiny spine-like scales giving them a fuzzy or velvety feel. Those prominent lines on the head and body are sensory canals used to detect the movement of nearby predators and prey – something we humans lack! Although we know little of their ecology and biology, coffinfishes share many features with their shallow-water cousins. They are ‘sit and wait’ ambush predators and have the first dorsal-fin spine on the head modified into a fishing rod, tipped with a lure that can be waved around to attract prey. Coffinfishes have a very short ‘fishing rod’ positioned just behind the snout and a mop-like lure that can be folded back into a shallow pit between the eyes when it’s not being used. They prey mostly on other fishes and crustaceans. Enigmatic, but not aerodynamic. An unidentified species of Chaunacops photographed by a remote underwater vehicle in deep water south-east of Hawaii. Source: NOAA Okeanos Explorer/NOAA Office of Ocean Exploration and Research, 2015 Hohonu Moana. While they can and do swim, coffinfishes are definitely not built for speed. Instead, they usually walk or amble over the seafloor using their arm-like pelvic and pectoral fins that look a bit like paddles. When threatened, they can defend themselves by inflating their bodies with water – just like the one we collected – making it much more difficult for a predator to swallow. About 10 coffinfish species are known from Australian waters, including some that are yet to be formally named and described. They are often difficult to identify, and we may have to wait until we’re back in our offices to work out if this little one already has a name, or is perhaps, a new species. I been reading your entire blog...which is fascinating! I love science! But I think of the damage to the world's oceans. I think of the oil drilling, net trawling, and decimated dwindling ocean species. It's hard to ignore the potential further decimation as humans explore this final earth frontier. I also wince at every creature you have had to kill on this voyage...irregardless of the benefits of scientific exploration. The photos are fascinating, but trawling is trawling. What is to stop commercial fisheries from developing new technologies to wipe the deepest ocean floors clean ? What's to stop them? Logic. What's to stop them? Logic. Fishing is already one of the most regulated industries in the world. They're going to go for the easiest profit, why would they not? There's no reason for commercial fisheries to trawl the deepest parts of the ocean when the meat lives in the easier to reach regions. Fishing has been around for millennia - if these researchers have the tech to toss nets down, the commercial fisheries assuredly do. They just don't care to. There's no point. The animals that live in the deep almost never see light and food is far more scarce. They're generally small, ugly and not profitable to bring up.